On arrival at Paris Gare du Nord make your way out of the main front door and you will see the Mercure Hotel Terminus Nord and several cafes across the street in front of you. Turn left and walk along Rue de Dunkerque. Immediately to the left of the station building is a narrow road turning, which climbs steeply between the buildings, cross this road. Continue past the shops, the Hotel Picardy is on the opposite side of the road. Cross Rue du Faub St Denis and Rue La Fayette. You are now walking in front of the Best Western Hotel and there is a car park on the opposite side of the road. 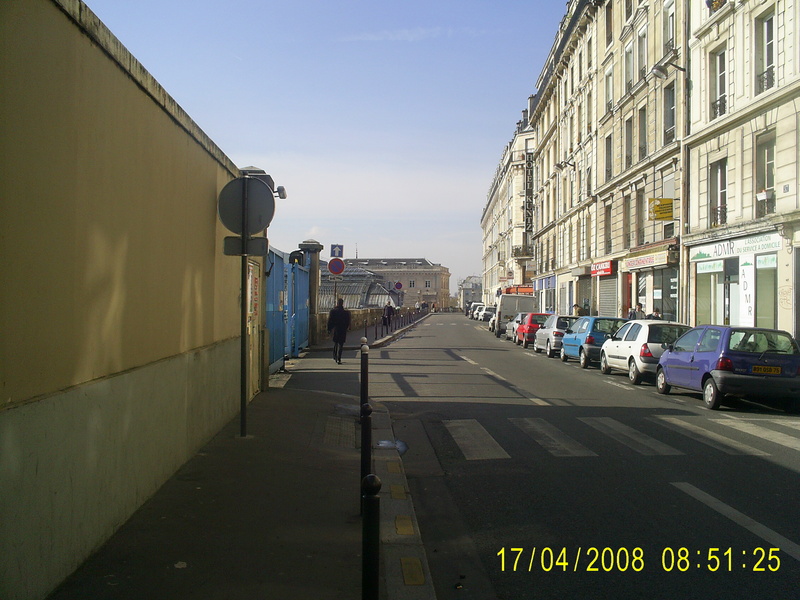 At the end of Rue de Dunkerque there is a wall in front of you, the rail tracks into Gare de l'est are on the opposite side of the wall. Turn right onto Rue d'Alsace, there will be various small shops on your right as you walk along the road. Rue des Deux Gares will be on your right but continue straight on. The road then becomes pedestrianised and you will walk down two flights of steps. 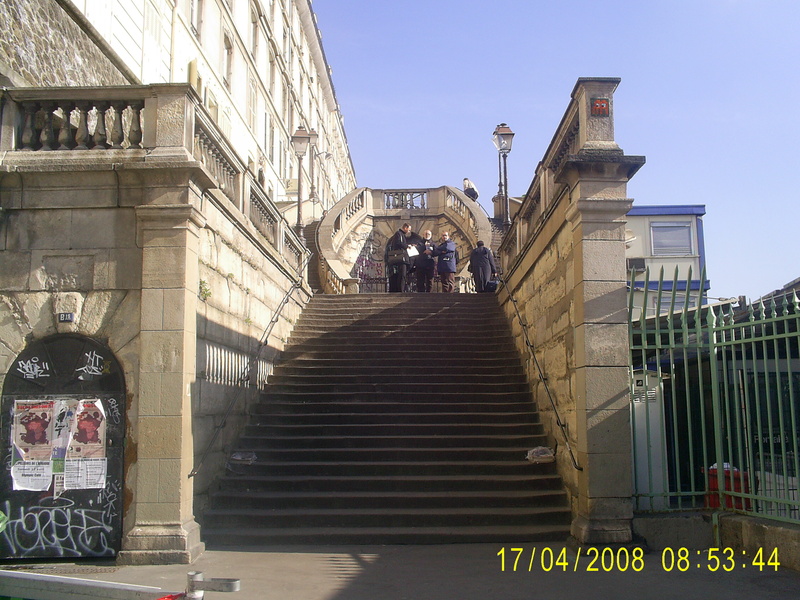 Gare de L'Est is at the bottom of the steps on the left hand side. Total distance is around 400 metres or 1300 feet. Standing with your back to the platforms take the exit on the right hand side of the station. This is Rue d'Alsace. Turn right as you exit, you will be able to see the platforms through the fences and there will be two flights of steps in front of you. Walk up the steps. 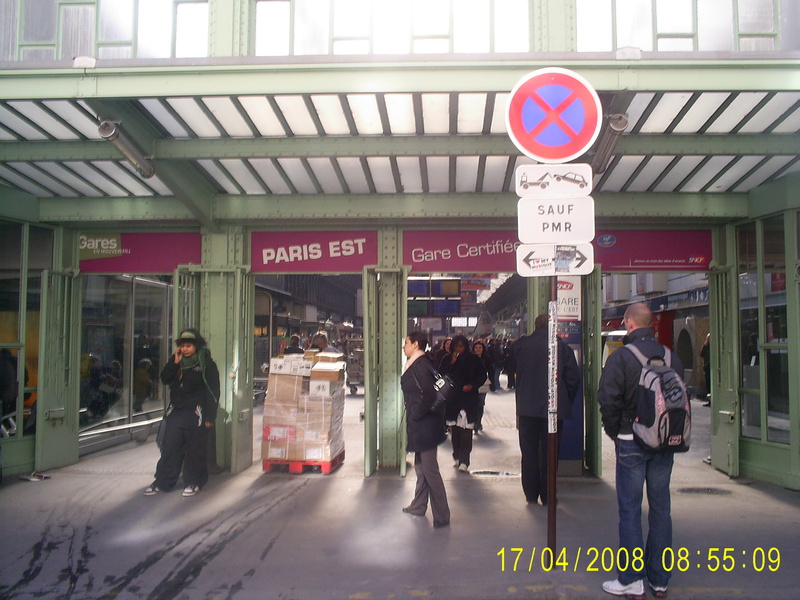 As you continue along Rue d'Alsace there are shops on your left and you can see the platform canopies of the station on the right. Pass the turning to Rue des Deux Gares on your left. After an entrance gate on the right hand side there is a high wall on your right. Take the next left turn, Rue de Dunkerque. You will see a carpark on your left and the Hotel Bristol on your right. Continue straight on, using the pedestrian crossings to cross Rue La Fayette and Rue du Faub St Denis. There are shops all around you, and the Hotel Apollo is on your left. You then cross a narrow unnamed road which climbs steeply between the buildings and the glass frontage of Gare du Nord is on your right. Exit Gare du Nord into the Boulevard de Denain straight ahead, between "Q" and the Mercure Hotel Terminus Nord is on the left. You are walking down a wide tree lined road, with shops on either side. At the end of this road is a major five way junction. Take the second exit on the left, Boulevard de Magenta. Rue de Valenciennes turns off immediately on the left, stay on Boulevard de Magenta. You are walking along another tree lined road, with shops and hotels in four storey buildings on either side. 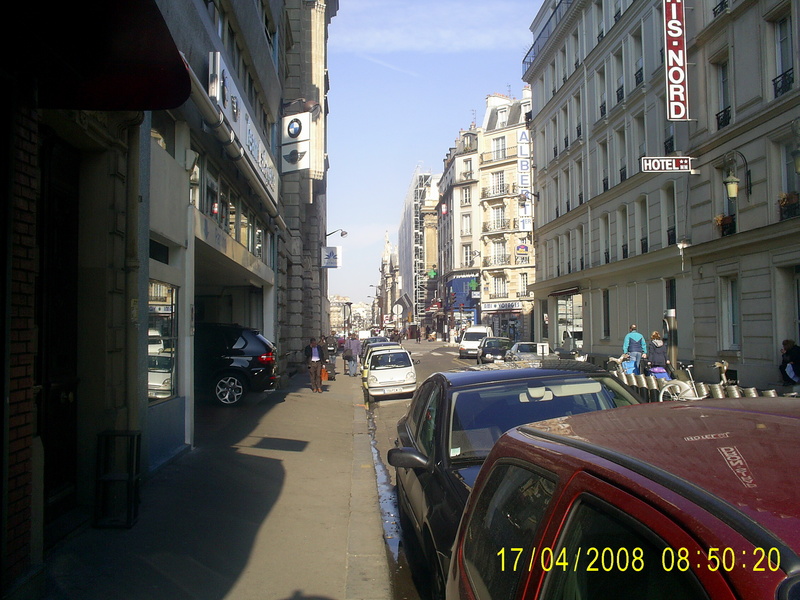 At the next road junction, with traffic lights, Rue de St Quentin goes off to the left and Rue des Petit Hotels to the right. Use the pedestrian crossings to continue straight on. The steel and glass market building "Ville de Paris, Marche St Quentin" will be on your right. Turn left on to Rue du Faub St Denis at the next set of traffic lights and immediately left again onto Rue du 8 Mai 1945. This is a slightly narrower road with a MacDonalds on the right, and a little further along the Inter Hotel Francais on your right. Rue d'Alsace forks off to the left, and Gare de l'Est is in front of you, behind the fence. Exit Paris Est station by the main front door, directly opposite the platforms. Turn right onto Rue du 8 Mai 1945. "Q" and Grand Hotel des Voyagers are on the opposite side of the road, and a Chinese restaurant and pharmacy are on your right. 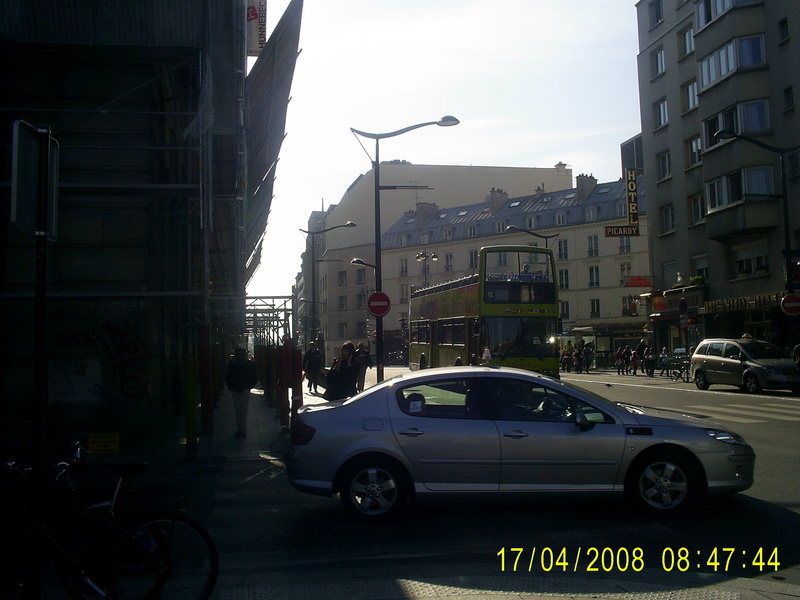 At a major road intersection turn slightly right onto Boulevard de Magenta. The steel and glass market building "Ville de Paris, Marche St Quentin" will be on your left. At the traffic lights continue straight on across Rue la Fayette and take the next right, immediately afterwards, Boulevard de Denain. 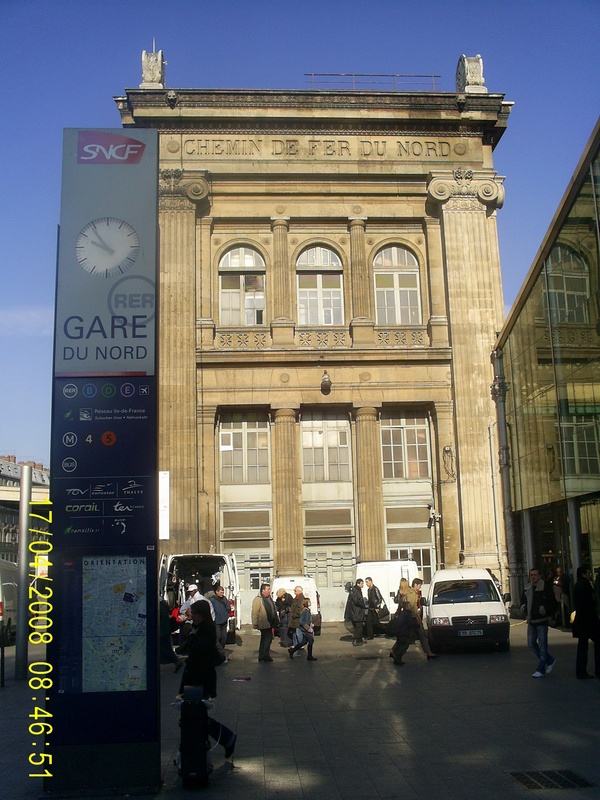 As you turn Paris Gare du Nord is visible at the end of the road, there are cafes on both sides of the tree lined road. Cross Pl. Napoléon III and enter Gare du Nord. Take RER line D in the direction of Malesherbes/Melun. Take RER line D in the direction of Orry-la-Ville Coye. Take RER line D in the direction of Malesherbes/Melun to Gare de Lyon. Then take metro line 14 in the direction of Olymplades. Then take RER line D in the direction of Orry-la-Ville Coye. Take metro line 5 in the direction of Place d'Italie. Take metro line 5 in the direction of Bobigny/Pablo Picasso. Take metro line 4 in the direction of Mairie de Montrouge. Take metro line 4 in the direction of Porte de Clignancourt. Take RER line E in the direction of Haussmann St Lazare. Take RER line E in the direction of Chelles Garnay. We have been informed that it is possible to book a wheelchair accessible taxi across Paris up to one week in advance of travel by calling +33 141276699. Feedback on this service would be appreciated. If you are in Paris for more than a few hours and plan to use public transport you may wish to consider purchasing a Paris Visite Card. Look at our City Cards page for more information.